When upgrading Dreamweaver always choose Advanced Options. Under Advanced Options, remove the check mark to the left of Remove Old Versions. If you allow Adobe to remove old version, you will need to reconfigure an extension manager and install all of your extensions. 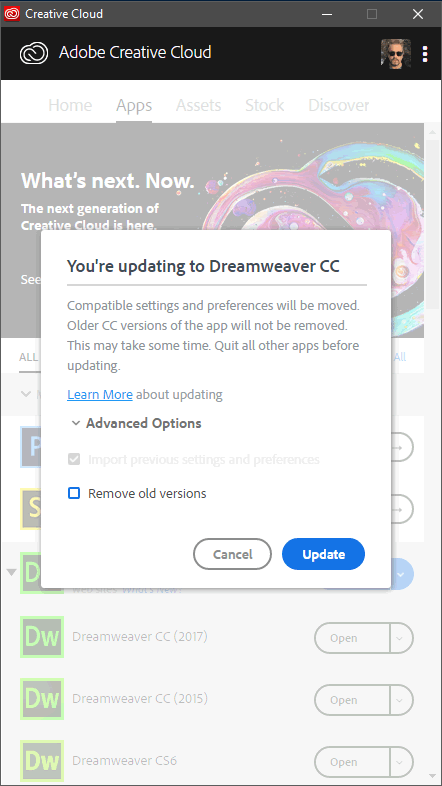 Adobe will not reliably migrate extensions if your previous version(s) of Dreamweaver are removed. This will enable you to test the new Dreamweaver before committing time and effort to reconfigure and re-install your add-ons and extensions. It will also increase the odds that Adobe will be able to successfully migrate your extensions.